A few months later Adam sent me the data. I was eager to plot it up on my screen right away to see if I could finally make sense of Snow White. But, as usual, it took a little extra time to calibrate data from a new instrument, and a little more time to figure out data that I hadn’t acquired myself, and a little more time to make sure I had done everything right, and by then I was out on sabbatical and out on a book tour and had sort of forgotten about Snow White. Snow White just stayed the large Kuiper belt object without a name. Finally (with a little prodding from Adam, who wanted to see how nicely the new instrument performed in the outer solar system), I pulled the data back out from the drawer in which I had stuck it and spent the time to figure out what was going on. And what was going on was both strange and familiar all at the same time. The surface of Snow White was covered in large quantities of water ice. 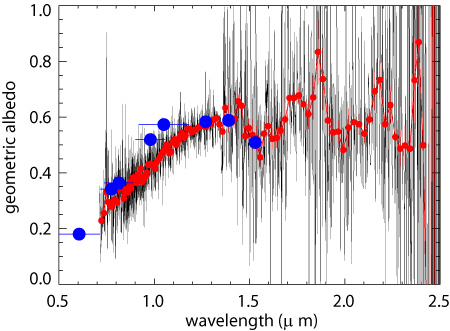 You can see that in the spectrum below, where you see the amount of sunlight reflected from Snow White from the visible part of the spectrum (on the left side) to the infrared (middle to right).The jagged grey line is the (very noisy) raw data, while the red points show what the data look like after a little appropriate smoothing (the blue points are from the Hubble Space Telescope, which is an added fun part of the story). Water ice is visible as the two dips in the amount of reflected sunlight at 1.5 and 2.0 microns.Water is pretty distinctive; nothing else has those dips just like it. Finding water ice is not a big surprise. Most Kuiper belt objects have a lot of it on the inside. But on the outside that water is usually cover with other stuff or mixed with gunk. Snow White had the most water ice on the surface we had ever seen. Almost. It still came nowhere near having the pure icy surface of Haumea and it’s pure ice fragments (which, you might recall, was what I had originally expected 2007 OR10 to be and led to the Snow White nickname). Snow White fit part of an interesting emerging trend: the medium-sized Kuiper belt objects preferentially had large amounts of ice on their surface. The trend includes Orcus, Quaoar, Charon, 2003 AZ84, and, now Snow White. There is no evidence that these objects have more ice on their insides (in fact, there is marginal evidence to suggest that they have less ice on their insides than the smaller Kuiper belt objects), it is just that they have more on their surfaces. There is one more clue to what is going on with all of this ice on large Kuiper belt objects. More than a decade ago, a friend and I discovered that Pluto’s moon Charon (which is also covered in large amounts of water), also has traces of ammonia on it (read all about it here, if you are interested). Ammonia is not a particularly abundant molecule, so there is no good reason to think that Charon is particularly abundant in ammonia. Ammonia is, however, a particularly good anti-freeze. If Charon had ammonia in its interior, that ammonia would have mixed with the liquid water of Charon’s early interior ocean (most medium sized Kuiper belt objects almost certainly had interior oceans, at least at some early time when their interiors were warmer than they are today) and let it stay liquid at temperatures much below 0 degrees Celsius. As Charon slowly cooled, however, even the anti-freeze wouldn’t have been enough, and the ice would have frozen. Freezing water expands. As it expands it squeezes any remaining liquid out through cracks until it flows on the surface. There is something funny about the water ice on Snow White, though: it is red. Ice is not red. There is no reason to expect that the original materials that were on the surface of Snow White before the icy volcanoes happened, by change, to contain some of the reddest materials in the outer solar system. This plot shows the size and temperature (actually it’s a more complicated effective temperature, but you’ll have to read the paper from Emily’s thesis if you care about the gory details!) of all of the known KBOs. The curves then show hot big or cold an object has to be to hold onto its atmosphere of methane, carbon monoxide, or molecular nitrogen (these three have all been detected on Pluto and Triton). Really large objects can hang on to atmospheres through their strong gravitational pulls. Really cold objects can hang on to their atmospheres simply because they are not warm enough to evaporate away. The really interesting ones are the ones in the middle. Makemake has lost much of its nitrogen but kept methane (we don’t yet know about the carbon monoxide) and Quaoar is just on the verge of having all of its methane gone. The methane is why Quaoar is red. If you have a methane atmosphere, you will have a methane frost. If you put methane on the surface of something in space and bombard it with sunlight and cosmic rays, that methane frost will turn red. More red than most things in the solar system. Snow White? No one has yet measured a precise size for Snow White, so we don’t know for sure where it fits on the plot. But if we make the assumption that Snow White has a surface which reflects as much sunlight as Quaoar’s we can put a point on the plot above (we also put generous error bars since we don’t know for sure). What we see is that Snow White, too, might be right on the edge of losing the last of its methane. I was shocked when I first plotted this. Snow White gets significantly closer to the sun (33 AU) than Quaoar ever does (41 AU), so I had always assumed that it was simply too warm to hang on to anything. But its extra large size is just enough. We suspect that Snow White, like Quaoar, has a last bit of atmosphere slowly evaporating away, and a bit of red methane frost on the surface as the last signature. That’s pretty good from just one quick test spectrum, I think. But there is, of course, more work to be done. The methane part is just a hypothesis. We now need to go back to a telescope and spend the serious amount of time required to verify that it is really there. And we need to give Snow White a real name now. I think, finally, it is safe to say that she deserves it. You might want to link part two to part three. I going to submit your articles to Fark. "The nitrogen went first, then the carbon monoxide", but freezing points N = 63K/CO=77K? So CO first, THEN N? Or have I got the freezing point values wrong? I was looking for 'various' icelines, hence melting/freezing point values. Which gas giant moon do you expect the medium and large-sized KBOs resemble most? Tethys and Dione, as well as Ariel and Titania have all experienced some serious cracking, but they have very different compositions. Triton most likely *is* a former KBO, but has experienced heavy resurfacing and now looks very different. Based on what we know about albedo differences on Pluto, are they are something totally new, nothing like we have seen before? How big would a KBO have to be to retain helium? Obviously larger than any found so far, but how much larger? Let's see, what are we going to do with 2007 OR10? It needs a name. Since we're out of names from the Greco-Roman tradition we'll need to go to some other tradition, maybe German? Is there any character from German tradition whose description fits this object? One "with skin white as snow, lips red as blood, and hair black as ebony"? In addition to white water ice and red methane snow, 2007 OR10 should have at least a few dark places like crater bottoms. So from a physical description I would think the name would be from the description above, which I got from the wikipedia article on Snow White. Snow White swallowed a poison apple and came back from the dead, which could be a reference to it's comparatively close perihelion. Snow White hung out with dwarves, like the astronomical object hanging out with Pluto and Haumea, and it turned out they were not such bad people after all. I saw the movie when I was very small, like a dwarf only due to my age. They're still running that movie. If that's not a classic, then I don't know what is. Xena was a classic, too. So, why not Snow White? It's a perfect fit for the object, and it's Xena's revenge. Go for it! Since 'Snow White' turns out to possess a 'red skin' a name from the Native American culture would make sense in some way. Anyway, I think it's high time this lonely object got a fitting name. '2007 OR10' just isn't very flattering. And let's throw in recognition as a dwarf planet while we're at it. Surely cryovolcanism would justify the assumption that the body is/was in hydrostatic equilibrium or would it? Wait, given Emily's plot, couldn't the same be done for a number of compounds and molecules and be used to help narrow down the error bars on KBOs (or possibly exo planets if we can even get spectrums)? I'm guessing that has a whole huge error stink of its own with uncertainty in temperature and composition (aggghhhh and even temperature and position have interdependencies without yet even talking about the errors in the measurements that were made to come up with the temp and composition...this is starting to sound impractical and unhelpful). As for a name: "Orten" has a nice ring to it. Wow. Thank you for the fascinating and informative trilogy. I love keeping up with the latest in the Kuiper belt--and you tell it so well! If the methane hypothesis is correct "Snow Red" is not too far off a literal description. Splatters of red methane on snow. It's a cherry snow-cone. Wikipedia modifies a 2006 NASA image and then caltech sources it as NASA. I guess we can call that coming full circle. It is intriguing that even relatively small terrestrial bodies could have hydrological cycles, liquid oceans, cryovulcanism and atmospheres. It would seem that the smaller you get, the less interesting you get; but there is some evidence to the contrary because one would expect less from a small world (no disrespect given to the popular Disneyland ride), but when a small world throws you a curve ball, it becomes interesting. Perhaps I could offer a remotely possible explanation for the curiously red, remote world; maybe algae like the red variety that grows in Antarctica, that turns snow and ice a bright red, could exist on other worlds such as Snow White. Could you wrap your mind around the possibility that life exists on other worlds? I like how Mr. Brown surreptitiously mentions 2003 AZ84 and leaves out its moon, hummm, but that is for another discussion for another day; may the spotlight shine brightly on Snow White aka Little Red Riding Hood and Cherry Snow Cone, today. How about Huitzilopochtli? He's a creation deity, so that fits the naming convention, and being a god of war and human sacrifice, it seems to be a good name for a red object. Have they started naming objects after Aztec deities yet? Awesome little world. Can't wait for more observations and results. "Hubble Space Telescope, which is an added fun part of the story"
Hmm... me thinks someone knows whether or not 2007 OR10 has a moon. Ha ha! Nope: no moon on Snow White. We've looked pretty hard w/HST two different times and nothing seems to be there. Any suggestions on a name for 'Snow White'...? Hi Mike,what in theory minimum albedo of TNO -3%,4%? 2002 TC302 - 2-3%, 4%, 5,1%? I would be honoured if you would consider my suggested name for this as yet anonymous dwarf planet: Sutekh. Sutekh is another name for the Egyptian god of chaos, storms, the night and the desert, Set. No asteroids or other celestial bodies are yet named after this mythological figure. However, he is by no means a minor character. He was worshipped as a benevolent deity by the Northern Egyptians, before the unification of Egypt resulted in his demonisation by the Southern Egyptians. Now we come to my main reasons for 'Snow White''s new name. Sutekh too was associated with the colour red, to the extent that he was known as the ‘Red Lord’, and redheads became associated with him. “Snow White”’s descent from dynamism to stasis reflects Sutekh’s demonisation from a popular god into a deity of darkness. Also, lest we forget, he is a god from the nation of Egypt, which borders the Red Sea, aptly for the red waters of 2007 OR10. Therefore, I implore you to consider the name 225088 Sutekh for ‘Snow White’, as I believe it would be an interesting and fitting name. I think Sutekh sounds spot on/precisely appropriate! I was going to say, why not name it Prometheus - I think humankind is really in need of with the energies of that god, speaking as an astrologer. Svantevit? God of war & prosperity, who rode a white horse (one of the god's names was Beli, meaning 'shining/bright white') that bore him into the fray & brought back the spoils of time itself: messages from the future, aka divination. His worship may be best known for the temple dedicated to him on the German isle of Rugen, whose original inhabitants, the Rujani, gave Rugen the earliest form of its name, Rujan. The name meant 'Red Island.' Svantevit had four faces, each regarding one of the four cardinal points of the compass (one meaning of his name is 'all-seeing'), each a different color: white (facing north toward the White Sea), red (Red Ruthenia, aka western Ukraine), black (Black Sea), green (Zelena Ukraina, Ukraine of the East). Every year, his horn of plenty was filled to overflowing with mead, signifying his role as the source of abundance. There were once claims this god was actually a fake & cobbled together from unrelated stories and materials and hearsay, though later research verified the Catholic Church had replaced him with St. Vitus, suggesting very strongly the god had genuinely existed and been an object of worship, after all. well Salacia has been used, so what about Neptune's other paredrae, Venilia? what about one of the siblings of Eris? 2007 OR10 has an orbit similar to Eris - perhaps a name of one of her siblings would be appropriate. Keres comes to mind, plucking dying soldiers from the field.. bloodied, like the redness of 2007 OR10. But honestly, you have done sucha great job naming your discoveries, I am sure you will come up with a good name for this one too. If no other name comes to mind, what about Caelus - which just means the sky, the heavens - the Roman god equivalent to Uranus. Or Aether, in Greek mythology the father of Uranus, because he was the God of the "upper air", which would be appropriate for 2007 OR10 because of it's extreme distance? As a British woman, I'd love it if you named it after a character from British mythology! The characters of our Arthurian legends, were originally, the gods and goddesses of our land, and out of these, it occurs to me that Dindrane, "the Grail heroine", could fit 2007 OR10 appropriately. She willingly gave up her blood and sacrificed her life, in order to cure a leprous lady, and so enabled her Knight companions to obtain the Grail. OR10's redness could stand for her blood, and it's original impression of whiteness, for the leprous lady, (leprosy being traditionally, biblically, connected with whiteness). I wonder what this will be named! What about Agni, after the Hindu God of fire, because of his connection between the earth and the distant heavens? Or after the Celtic Goddess Brigid, as she was connected to elevation, and this body gets so very distant from the earth? Name connects themes of temperature and color. It maintains the sense of obscurity of the object and it preserves the object's "femininity". "Thanatos" - new name of this object ! I really think you should be the one to name 2007 OR10. However, I have heard that the IAU will leave it up to the public in 2017. If this happens could you post the link? Since 2007 OR10 was given a female nickname, Snow White, and since there are not many planets with female names why not give it a female name. I would suggest Meg or Lillah.